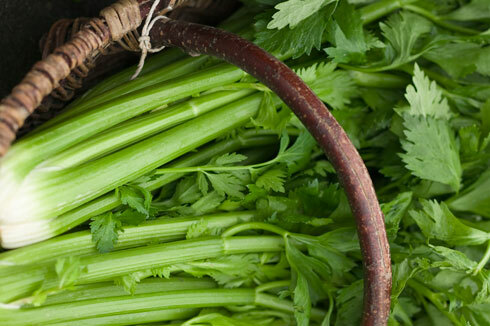 Celery is a biennial vegetable, although grown as an annual for its tight cluster of crescent-sectioned stalks, The most commonly cultivated varieties are green, pink or red. The green cultivars will mature first followed by the pink and lastly the red. Red celery is the hardiest of all forms of celery. These regular cultivars will need to be grown in trenches and earthed up for blanching prior to harvesting. Self-blanching white or green celery varieties will not need earthing up but are far less hardy than regular cultivars and must be cleared from the ground outside before the first frosts. The stalks of trench grown celery are not usually blanched sufficiently for use until at least eight weeks after the first earthing up. The first earthing up is usually around mid-August. 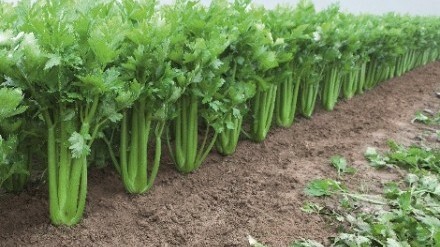 Self-blanching celery varieties should be ready for harvesting from the end of August onward. Typically, the time to harvest celery is 85 to 120 days after planting out into their outside bed. The variance is due to the time of planting, seasonal weather conditions and specific cultivars. Of course, for the harvest day period to be of any use you will need to take note of the date when planting out. Celery can be harvested as soon as the bottom stalks are at least 6 inches long, from ground level to the first leaf node. The stalks should still be close together, forming a compact bunch approximately 3 inches in diameter. Cut the stalks below where they are joined together, as near to the roots basal plate as possible. That way the entire plant can be lifted in one go. When a plant is removed fill in the gap with soil to prevent too much light reaching the remaining plants.